DotNetNuke is an open source CMS based on Microsoft ASP.NET technology. It is highly used to deploy, develop and manage a huge database of the websites. Storing and managing contents with DotNetNuke is much easier for the website owners. We at SynapseWebSolutions have the years of expertise in DotNetNuke development. With our years of expertise in DotNetNuke CMS, we at SynapseWebSolutions are ready to meet the technological challenges. brings with its DotNetNuke specialty? We have the best team of DotNetNuke developers in the UK. Our speciality of client-oriented DotNetNuke services lies in DotNetNuke (DNN) portal development, DotNetNuke (DNN) Module Development, Skins development and DNN Portal maintenance. We facilitate highly interactive, web-based, and database-driven content management systems, which are customized to meet specific needs of your business. We also customize existing DNN modules and develop modules, multi-layout designs and template for different business. We are recognized for bringing the best solutions for our esteemed clients. We specially take care of developing the easy to manage admin interface so that the website owners can manage everything at their own end. Our highly interactive interface as per your requirement would allow you to manage site content, implement the inbuilt features, assign membership role and manage security levels in the best possible manners. If you are looking to set up a DNN website for your business or want a DNN customization, you can hire our developers. 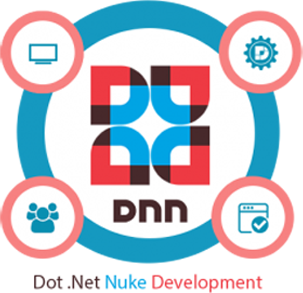 Available for both 'offshore' and 'onsite' DNN development services, we enable you with expert DNN solutions in the best budget range. Outsourcing your DotNetNuke development needs to us is the best business solution for you. Our developers are friendly in communication and they better understand your requirements to let you achieve the new business dimensions.